Manners for men / script: Peter Wesley-Smith ; music: Martin Wesley-Smith. 1 libretto (7 p.) ; 30 cm. Score: Manners for men / lyric: Peter Wesley-Smith ; music: Martin Wesley-Smith. Parts: Manners for men / lyric: Peter Wesley-Smith ; music: Martin Wesley-Smith. Score: Manners for men / libretto: Peter Wesley-Smith ; music: Martin Wesley-Smith. 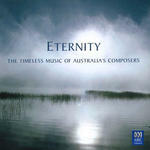 CD: Eternity : the timeless music of Australia's composers.